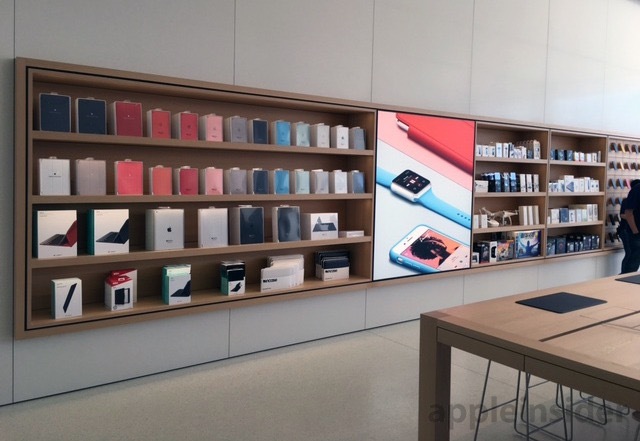 Apple officially opened one of its first Jony Ive-inspired “next-generation” retail stores in the U.S. over the weekend. 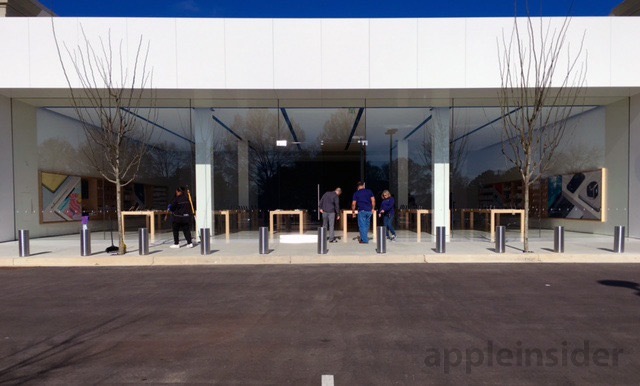 The new-look store is located at the Shops of Saddle Creek South in Germantown, a suburb of Memphis, Tennessee, and shows off some of the new design elements, as shown in photos provided to AppleInsider. Memphis Apple Store The store is described as having a high-flung ceiling lined with light panels and spotlights, which illuminate product display tables that have been arranged to maximize floorspace and achieve a sense of openness. Memphis Apple Store The wooden tables have been redesigned by Ive and now contain motion sensors that operate a flip-up panel concealing power outlets and ports. 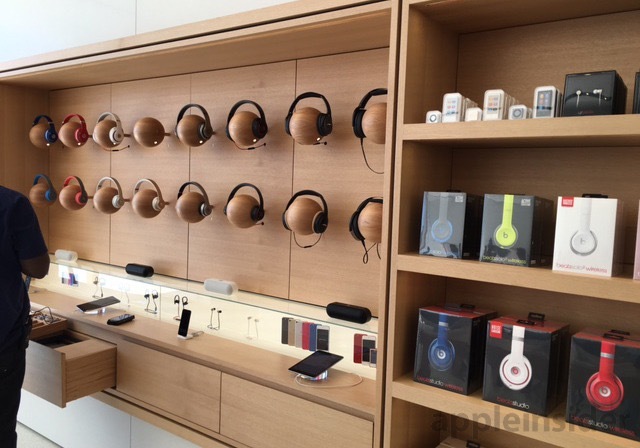 Memphis Apple Store New wooden accessory display installations adorn the walls, and feature a headphone tryout area along with shelves for speakers, docks and other products. Apple Store screen Undoubtedly the biggest new addition though is a gigantic 37-foot display screen opposite the store’s all-glass frontage. The high-resolution array is encased in a black housing and fills almost the entire wall with its edge-to-edge display. Plans for the next-generation Memphis store were revealed in an August 2015 building permit application. In February 2015, The New Yorker ran a profile of Jony Ive which included details of the collaboration between Ive and retail chief Angela Ahrendts in coming up with the redesign, which is slowly being introduced in the company’s latest stores. 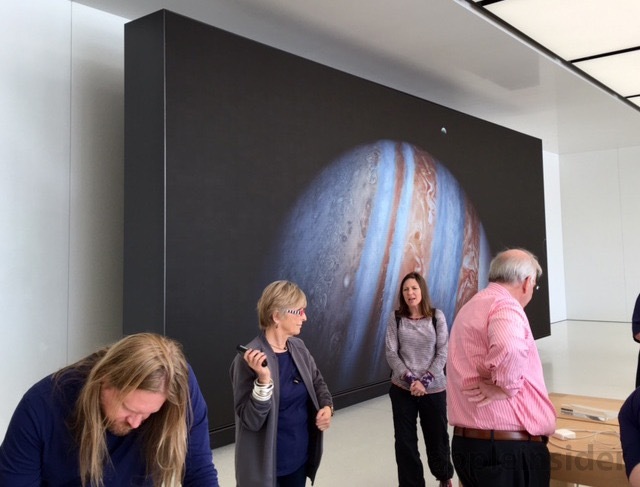 In December, 60 Minutes viewers got a peek at Apple’s next-generation design when correspondent Charlie Rose spoke to Ahrendts in a mock store located in an unmarked warehouse off Apple’s Cupertino headquarters. Posted on March 29, 2016, in Other. Bookmark the permalink. Leave a comment.